'Our cousin of Scotland' was ugly, awkward, and shuffling both in mind and person. His tongue was much too large for his mouth, his legs were much too weak for his body, and his dull goggle-eyes stared and rolled like an idiot's. He was cunning, covetous, wasteful, idle, drunken, greedy, dirty, cowardly, a great swearer, and the most conceited man on earth. 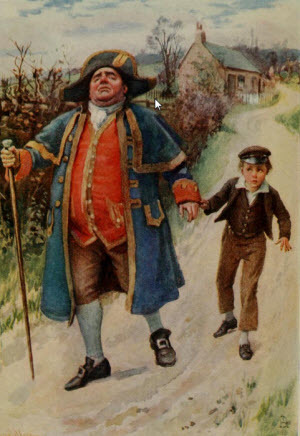 His figure--what is commonly called rickety from his birth--presented a most ridiculous appearance, dressed in thick padded clothes, as a safeguard against being stabbed (of which he lived in continual fear), of a grass-green colour from head to foot, with a hunting-horn dangling at his side instead of a sword, and his hat and feather sticking over one eye, or hanging on the back of his head, as he happened to toss it on. He used to loll on the necks of his favourite courtiers, and slobber their faces, and kiss and pinch their cheeks; and the greatest favourite he ever had, used to sign himself in his letters to his royal master, His Majesty's 'dog and slave,' and used to address his majesty as 'his Sowship.' His majesty was the worst rider ever seen, and thought himself the best. He was one of the most impertinent talkers (in the broadest Scotch) ever heard, and boasted of being unanswerable in all manner of argument. He wrote some of the most wearisome treatises ever read--among others, a book upon witchcraft, in which he was a devout believer--and thought himself a prodigy of authorship. He thought, and wrote, and said, that a king had a right to make and unmake what laws he pleased, and ought to be accountable to nobody on earth. This is the plain, true character of the personage whom the greatest men about the court praised and flattered to that degree, that I doubt if there be anything much more shameful in the annals of human nature. He came to the English throne with great ease. The miseries of a disputed succession had been felt so long, and so dreadfully, that he was proclaimed within a few hours of Elizabeth's death, and was accepted by the nation, even without being asked to give any pledge that he would govern well, or that he would redress crying grievances. He took a month to come from Edinburgh to London; and, by way of exercising his new power, hanged a pickpocket on the journey without any trial, and knighted everybody he could lay hold of. He made two hundred knights before he got to his palace in London, and seven hundred before he had been in it three months. He also shovelled sixty-two new peers into the House of Lords--and there was a pretty large sprinkling of Scotchmen among them, you may believe. His Sowship's prime Minister, CECIL (for I cannot do better than call his majesty what his favourite called him), was the enemy of Sir Walter Raleigh, and also of Sir Walter's political friend, LORD COBHAM; and his Sowship's first trouble was a plot originated by these two, and entered into by some others, with the old object of seizing the King and keeping him in imprisonment until he should change his ministers. There were Catholic priests in the plot, and there were Puritan noblemen too; for, although the Catholics and Puritans were strongly opposed to each other, they united at this time against his Sowship, because they knew that he had a design against both, after pretending to be friendly to each; this design being to have only one high and convenient form of the Protestant religion, which everybody should be bound to belong to, whether they liked it or not. This plot was mixed up with another, which may or may not have had some reference to placing on the throne, at some time, the LADY ARABELLA STUART; whose misfortune it was, to be the daughter of the younger brother of his Sowship's father, but who was quite innocent of any part in the scheme. Sir Walter Raleigh was accused on the confession of Lord Cobham--a miserable creature, who said one thing at one time, and another thing at another time, and could be relied upon in nothing. The trial of Sir Walter Raleigh lasted from eight in the morning until nearly midnight; he defended himself with such eloquence, genius, and spirit against all accusations, and against the insults of COKE, the Attorney- General--who, according to the custom of the time, foully abused him--that those who went there detesting the prisoner, came away admiring him, and declaring that anything so wonderful and so captivating was never heard. He was found guilty, nevertheless, and sentenced to death. Execution was deferred, and he was taken to the Tower. The two Catholic priests, less fortunate, were executed with the usual atrocity; and Lord Cobham and two others were pardoned on the scaffold. His Sowship thought it wonderfully knowing in him to surprise the people by pardoning these three at the very block; but, blundering, and bungling, as usual, he had very nearly overreached himself. For, the messenger on horseback who brought the pardon, came so late, that he was pushed to the outside of the crowd, and was obliged to shout and roar out what he came for. The miserable Cobham did not gain much by being spared that day. He lived, both as a prisoner and a beggar, utterly despised, and miserably poor, for thirteen years, and then died in an old outhouse belonging to one of his former servants. This plot got rid of, and Sir Walter Raleigh safely shut up in the Tower, his Sowship held a great dispute with the Puritans on their presenting a petition to him, and had it all his own way--not so very wonderful, as he would talk continually, and would not hear anybody else--and filled the Bishops with admiration. It was comfortably settled that there was to be only one form of religion, and that all men were to think exactly alike. But, although this was arranged two centuries and a half ago, and although the arrangement was supported by much fining and imprisonment, I do not find that it is quite successful, even yet. His object was, when the King, lords, and commons, should be assembled at the next opening of Parliament, to blow them up, one and all, with a great mine of gunpowder. The first person to whom he confided this horrible idea was THOMAS WINTER, a Worcestershire gentleman who had served in the army abroad, and had been secretly employed in Catholic projects. While Winter was yet undecided, and when he had gone over to the Netherlands, to learn from the Spanish Ambassador there whether there was any hope of Catholics being relieved through the intercession of the King of Spain with his Sowship, he found at Ostend a tall, dark, daring man, whom he had known when they were both soldiers abroad, and whose name was GUIDO--or GUY--FAWKES. Resolved to join the plot, he proposed it to this man, knowing him to be the man for any desperate deed, and they two came back to England together. Here, they admitted two other conspirators; THOMAS PERCY, related to the Earl of Northumberland, and JOHN WRIGHT, his brother-in-law. All these met together in a solitary house in the open fields which were then near Clement's Inn, now a closely blocked-up part of London; and when they had all taken a great oath of secrecy, Catesby told the rest what his plan was. 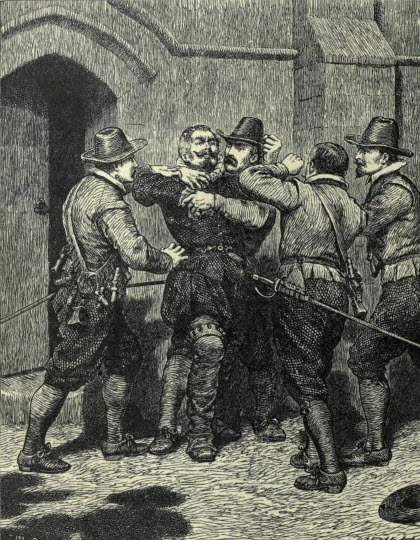 They then went up-stairs into a garret, and received the Sacrament from FATHER GERARD, a Jesuit, who is said not to have known actually of the Gunpowder Plot, but who, I think, must have had his suspicions that there was something desperate afoot. They found it dismal work alone there, underground, with such a fearful secret on their minds, and so many murders before them. They were filled with wild fancies. Sometimes, they thought they heard a great bell tolling, deep down in the earth under the Parliament House; sometimes, they thought they heard low voices muttering about the Gunpowder Plot; once in the morning, they really did hear a great rumbling noise over their heads, as they dug and sweated in their mine. 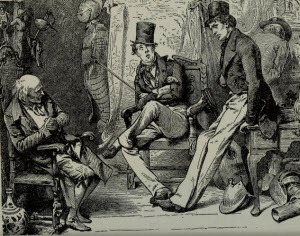 Every man stopped and looked aghast at his neighbour, wondering what had happened, when that bold prowler, Fawkes, who had been out to look, came in and told them that it was only a dealer in coals who had occupied a cellar under the Parliament House, removing his stock in trade to some other place. Upon this, the conspirators, who with all their digging and digging had not yet dug through the tremendously thick wall, changed their plan; hired that cellar, which was directly under the House of Lords; put six- and-thirty barrels of gunpowder in it, and covered them over with fagots and coals. Then they all dispersed again till September, when the following new conspirators were admitted; SIR EDWARD BAYNHAM, of Gloucestershire; SIR EVERARD DIGBY, of Rutlandshire; AMBROSE ROOKWOOD, of Suffolk; FRANCIS TRESHAM, of Northamptonshire. Most of these were rich, and were to assist the plot, some with money and some with horses on which the conspirators were to ride through the country and rouse the Catholics after the Parliament should be blown into air. The ministers and courtiers made out that his Sowship, by a direct miracle from Heaven, found out what this letter meant. The truth is, that they were not long (as few men would be) in finding out for themselves; and it was decided to let the conspirators alone, until the very day before the opening of Parliament. That the conspirators had their fears, is certain; for, Tresham himself said before them all, that they were every one dead men; and, although even he did not take flight, there is reason to suppose that he had warned other persons besides Lord Mounteagle. However, they were all firm; and Fawkes, who was a man of iron, went down every day and night to keep watch in the cellar as usual. He was there about two in the afternoon of the fourth, when the Lord Chamberlain and Lord Mounteagle threw open the door and looked in. 'Who are you, friend?' said they. 'Why,' said Fawkes, 'I am Mr. Percy's servant, and am looking after his store of fuel here.' 'Your master has laid in a pretty good store,' they returned, and shut the door, and went away. Fawkes, upon this, posted off to the other conspirators to tell them all was quiet, and went back and shut himself up in the dark, black cellar again, where he heard the bell go twelve o'clock and usher in the fifth of November. About two hours afterwards, he slowly opened the door, and came out to look about him, in his old prowling way. He was instantly seized and bound, by a party of soldiers under SIR THOMAS KNEVETT. He had a watch upon him, some touchwood, some tinder, some slow matches; and there was a dark lantern with a candle in it, lighted, behind the door. He had his boots and spurs on--to ride to the ship, I suppose--and it was well for the soldiers that they took him so suddenly. If they had left him but a moment's time to light a match, he certainly would have tossed it in among the powder, and blown up himself and them. They took him to the King's bed-chamber first of all, and there the King (causing him to be held very tight, and keeping a good way off), asked him how he could have the heart to intend to destroy so many innocent people? 'Because,' said Guy Fawkes, 'desperate diseases need desperate remedies.' To a little Scotch favourite, with a face like a terrier, who asked him (with no particular wisdom) why he had collected so much gunpowder, he replied, because he had meant to blow Scotchmen back to Scotland, and it would take a deal of powder to do that. Next day he was carried to the Tower, but would make no confession. Even after being horribly tortured, he confessed nothing that the Government did not already know; though he must have been in a fearful state--as his signature, still preserved, in contrast with his natural hand-writing before he was put upon the dreadful rack, most frightfully shows. Bates, a very different man, soon said the Jesuits had had to do with the plot, and probably, under the torture, would as readily have said anything. Tresham, taken and put in the Tower too, made confessions and unmade them, and died of an illness that was heavy upon him. Rookwood, who had stationed relays of his own horses all the way to Dunchurch, did not mount to escape until the middle of the day, when the news of the plot was all over London. On the road, he came up with the two Wrights, Catesby, and Percy; and they all galloped together into Northamptonshire. Thence to Dunchurch, where they found the proposed party assembled. Finding, however, that there had been a plot, and that it had been discovered, the party disappeared in the course of the night, and left them alone with Sir Everard Digby. Away they all rode again, through Warwickshire and Worcestershire, to a house called Holbeach, on the borders of Staffordshire. They tried to raise the Catholics on their way, but were indignantly driven off by them. All this time they were hotly pursued by the sheriff of Worcester, and a fast increasing concourse of riders. At last, resolving to defend themselves at Holbeach, they shut themselves up in the house, and put some wet powder before the fire to dry. But it blew up, and Catesby was singed and blackened, and almost killed, and some of the others were sadly hurt. Still, knowing that they must die, they resolved to die there, and with only their swords in their hands appeared at the windows to be shot at by the sheriff and his assistants. Catesby said to Thomas Winter, after Thomas had been hit in the right arm which dropped powerless by his side, 'Stand by me, Tom, and we will die together!' --which they did, being shot through the body by two bullets from one gun. John Wright, and Christopher Wright, and Percy, were also shot. Rookwood and Digby were taken: the former with a broken arm and a wound in his body too. It was the fifteenth of January, before the trial of Guy Fawkes, and such of the other conspirators as were left alive, came on. They were all found guilty, all hanged, drawn, and quartered: some, in St. Paul's Churchyard, on the top of Ludgate-hill; some, before the Parliament House. A Jesuit priest, named HENRY GARNET, to whom the dreadful design was said to have been communicated, was taken and tried; and two of his servants, as well as a poor priest who was taken with him, were tortured without mercy. He himself was not tortured, but was surrounded in the Tower by tamperers and traitors, and so was made unfairly to convict himself out of his own mouth. He said, upon his trial, that he had done all he could to prevent the deed, and that he could not make public what had been told him in confession--though I am afraid he knew of the plot in other ways. He was found guilty and executed, after a manful defence, and the Catholic Church made a saint of him; some rich and powerful persons, who had had nothing to do with the project, were fined and imprisoned for it by the Star Chamber; the Catholics, in general, who had recoiled with horror from the idea of the infernal contrivance, were unjustly put under more severe laws than before; and this was the end of the Gunpowder Plot. These disputes with his Parliaments, and his hunting, and his drinking, and his lying in bed--for he was a great sluggard--occupied his Sowship pretty well. The rest of his time he chiefly passed in hugging and slobbering his favourites. The first of these was SIR PHILIP HERBERT, who had no knowledge whatever, except of dogs, and horses, and hunting, but whom he soon made EARL OF MONTGOMERY. The next, and a much more famous one, was ROBERT CARR, or KER (for it is not certain which was his right name), who came from the Border country, and whom he soon made VISCOUNT ROCHESTER, and afterwards, EARL OF SOMERSET. The way in which his Sowship doted on this handsome young man, is even more odious to think of, than the way in which the really great men of England condescended to bow down before him. The favourite's great friend was a certain SIR THOMAS OVERBURY, who wrote his love-letters for him, and assisted him in the duties of his many high places, which his own ignorance prevented him from discharging. But this same Sir Thomas having just manhood enough to dissuade the favourite from a wicked marriage with the beautiful Countess of Essex, who was to get a divorce from her husband for the purpose, the said Countess, in her rage, got Sir Thomas put into the Tower, and there poisoned him. Then the favourite and this bad woman were publicly married by the King's pet bishop, with as much to-do and rejoicing, as if he had been the best man, and she the best woman, upon the face of the earth. But, after a longer sunshine than might have been expected--of seven years or so, that is to say--another handsome young man started up and eclipsed the EARL OF SOMERSET. This was GEORGE VILLIERS, the youngest son of a Leicestershire gentleman: who came to Court with all the Paris fashions on him, and could dance as well as the best mountebank that ever was seen. He soon danced himself into the good graces of his Sowship, and danced the other favourite out of favour. Then, it was all at once discovered that the Earl and Countess of Somerset had not deserved all those great promotions and mighty rejoicings, and they were separately tried for the murder of Sir Thomas Overbury, and for other crimes. But, the King was so afraid of his late favourite's publicly telling some disgraceful things he knew of him--which he darkly threatened to do--that he was even examined with two men standing, one on either side of him, each with a cloak in his hand, ready to throw it over his head and stop his mouth if he should break out with what he had it in his power to tell. So, a very lame affair was purposely made of the trial, and his punishment was an allowance of four thousand pounds a year in retirement, while the Countess was pardoned, and allowed to pass into retirement too. They hated one another by this time, and lived to revile and torment each other some years. And this mention of Sir Walter Raleigh, who had many faults, but who never showed so many merits as in trouble and adversity, may bring me at once to the end of his sad story. After an imprisonment in the Tower of twelve long years, he proposed to resume those old sea voyages of his, and to go to South America in search of gold. His Sowship, divided between his wish to be on good terms with the Spaniards through whose territory Sir Walter must pass (he had long had an idea of marrying Prince Henry to a Spanish Princess), and his avaricious eagerness to get hold of the gold, did not know what to do. But, in the end, he set Sir Walter free, taking securities for his return; and Sir Walter fitted out an expedition at his own coast and, on the twenty-eighth of March, one thousand six hundred and seventeen, sailed away in command of one of its ships, which he ominously called the Destiny. The expedition failed; the common men, not finding the gold they had expected, mutinied; a quarrel broke out between Sir Walter and the Spaniards, who hated him for old successes of his against them; and he took and burnt a little town called SAINT THOMAS. For this he was denounced to his Sowship by the Spanish Ambassador as a pirate; and returning almost broken-hearted, with his hopes and fortunes shattered, his company of friends dispersed, and his brave son (who had been one of them) killed, he was taken--through the treachery of SIR LEWIS STUKELY, his near relation, a scoundrel and a Vice- Admiral--and was once again immured in his prison-home of so many years. The new favourite got on fast. He was made a viscount, he was made Duke of Buckingham, he was made a marquis, he was made Master of the Horse, he was made Lord High Admiral--and the Chief Commander of the gallant English forces that had dispersed the Spanish Armada, was displaced to make room for him. He had the whole kingdom at his disposal, and his mother sold all the profits and honours of the State, as if she had kept a shop. He blazed all over with diamonds and other precious stones, from his hatband and his earrings to his shoes. Yet he was an ignorant presumptuous, swaggering compound of knave and fool, with nothing but his beauty and his dancing to recommend him. This is the gentleman who called himself his Majesty's dog and slave, and called his Majesty Your Sowship. His Sowship called him STEENIE; it is supposed, because that was a nickname for Stephen, and because St. Stephen was generally represented in pictures as a handsome saint. 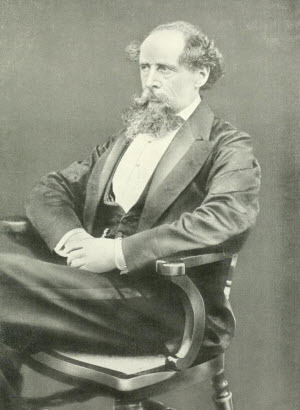 His Sowship was driven sometimes to his wits'-end by his trimming between the general dislike of the Catholic religion at home, and his desire to wheedle and flatter it abroad, as his only means of getting a rich princess for his son's wife: a part of whose fortune he might cram into his greasy pockets. Prince Charles--or as his Sowship called him, Baby Charles--being now PRINCE OF WALES, the old project of a marriage with the Spanish King's daughter had been revived for him; and as she could not marry a Protestant without leave from the Pope, his Sowship himself secretly and meanly wrote to his Infallibility, asking for it. The negotiation for this Spanish marriage takes up a larger space in great books, than you can imagine, but the upshot of it all is, that when it had been held off by the Spanish Court for a long time, Baby Charles and Steenie set off in disguise as Mr. Thomas Smith and Mr. John Smith, to see the Spanish Princess; that Baby Charles pretended to be desperately in love with her, and jumped off walls to look at her, and made a considerable fool of himself in a good many ways; that she was called Princess of Wales and that the whole Spanish Court believed Baby Charles to be all but dying for her sake, as he expressly told them he was; that Baby Charles and Steenie came back to England, and were received with as much rapture as if they had been a blessing to it; that Baby Charles had actually fallen in love with HENRIETTA MARIA, the French King's sister, whom he had seen in Paris; that he thought it a wonderfully fine and princely thing to have deceived the Spaniards, all through; and that he openly said, with a chuckle, as soon as he was safe and sound at home again, that the Spaniards were great fools to have believed him. Like most dishonest men, the Prince and the favourite complained that the people whom they had deluded were dishonest. They made such misrepresentations of the treachery of the Spaniards in this business of the Spanish match, that the English nation became eager for a war with them. Although the gravest Spaniards laughed at the idea of his Sowship in a warlike attitude, the Parliament granted money for the beginning of hostilities, and the treaties with Spain were publicly declared to be at an end. The Spanish ambassador in London--probably with the help of the fallen favourite, the Earl of Somerset--being unable to obtain speech with his Sowship, slipped a paper into his hand, declaring that he was a prisoner in his own house, and was entirely governed by Buckingham and his creatures. The first effect of this letter was that his Sowship began to cry and whine, and took Baby Charles away from Steenie, and went down to Windsor, gabbling all sorts of nonsense. The end of it was that his Sowship hugged his dog and slave, and said he was quite satisfied. His Sowship's eyes were getting red with eagerly looking for the money, when the end of a gluttonous life came upon him; and, after a fortnight's illness, on Sunday the twenty-seventh of March, one thousand six hundred and twenty-five, he died. He had reigned twenty-two years, and was fifty- nine years old. I know of nothing more abominable in history than the adulation that was lavished on this King, and the vice and corruption that such a barefaced habit of lying produced in his court. It is much to be doubted whether one man of honour, and not utterly self-disgraced, kept his place near James the First. Lord Bacon, that able and wise philosopher, as the First Judge in the Kingdom in this reign, became a public spectacle of dishonesty and corruption; and in his base flattery of his Sowship, and in his crawling servility to his dog and slave, disgraced himself even more. But, a creature like his Sowship set upon a throne is like the Plague, and everybody receives infection from him.